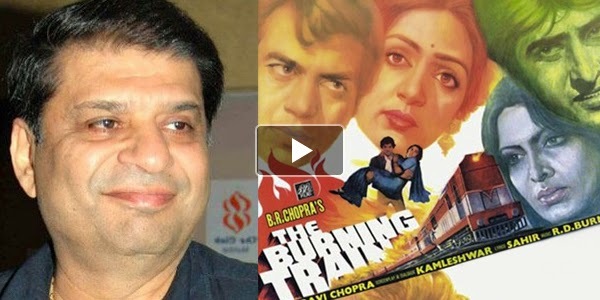 With the sudden demise of filmmaker Ravi Chopra the film industry lost an intelligent filmmaker who played a pivotal role in revolutionizing hi-tech expertise in Bollywood with his multi starrer movie THE BURNING TRAIN (1980) inspired from Hollywood disaster movies of the 1970s, like THE POSEIDON ADVENTURE and THE TOWERING INFERNO, a genre never attempted in Bollywood. Readers would be surprised to know that Ravi Chopra was the First film director to import VFX team from 20th Fox to give the thrilling special effects and succeeded to a certain extent. Though the movie was a failure it set standards for hi-technology in Bollywood. Son of legendary filmmaker B.R.Chopra and nephew of another great film maker Yash Chopra, Ravi Chopra made his debut with Amitabh Bachchan starrer ZAMEER (1975) and hold the distinction of directing thespian Dilip Kumar too in his movie MAZDOOR (1983) but lady was not on his side. Finally fortune smiled when he took to small screen and made the television serial MAHABHARAT, which was aired during 1988-1990. The serial established him as a competent director. Sonakshi Sinha fumes at KRK’s Offensive Twitter!